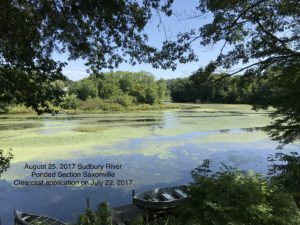 The Friends of Saxonville, FOS, recognize that the Sudbury River is the primary reason that Saxonville developed in 1700. 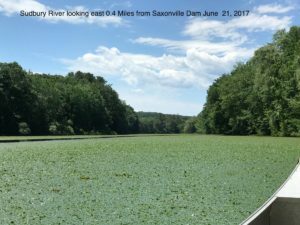 The waterpower that was generated by damming the river brought manufacturing and development to Saxonville. The river is an environmental gem providing a wonderful habitat for native species plant and animal alike. It has also been a source of recreation for hundreds of years. 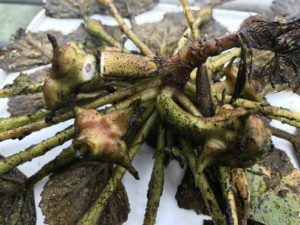 During the last ten years the river has been transformed into a quagmire of invasive vegetation, (Water Chestnuts) and has become unusable for summer recreation, and is in danger of becoming stagnant. Native plant and animal species have also been severely impacted and displaced. In 2016, FOS recognized the need to provide oversight for the river. 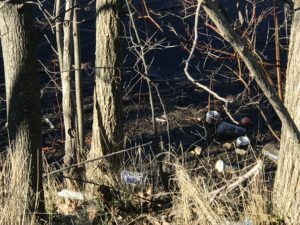 Starting as a grassroots initiative by residents that were concerned about the incredibly invasive vegetation that was severely carpeting the river from the Saxonville Dam upriver just past the Wickford Street Bridge (1.2 miles). Concerned citizens and river abutters brought this issue to the Framingham Conservation Commission. The FCC acknowledged the severity of the crisis and began discussion of a plan to remediate the problem. FOS realized they also had to be advocates of the river, and created the River Stewards Committee, with river abutter, Ron Chick as chairman. He, along with neighbors spearheaded the committee to help restore the health and recreational use of the river. Alison Field-Juma, OARS Executive Director, and her dedicated team have provided valuable guidance and support throughout this community effort. 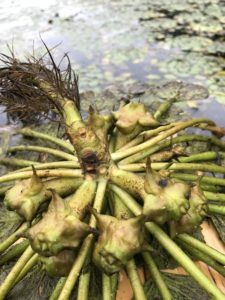 The FOS River Steward's Committee and the Framingham Conservation Commission led an effort to begin the remediation of the non-native “Water Chestnuts” in the Sudbury River in Saxonville. The vegetation had covered 93% of the river by the summer of 2016. It severely impacted the habitat for native plant and animal species and making the river unsuitable for recreation. 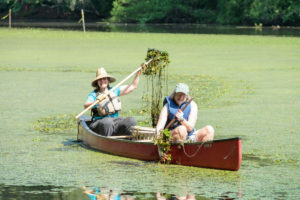 This invasive plant has endangered the health of the river to the brink of stagnation. The Conservation Commission worked thoughtfully to create a five-year plan to help remediate this crisis on the river. The first year is now complete. 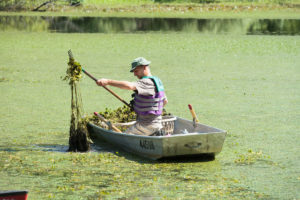 Solitude Lake Management implemented a three-part application of the state and regionally approved herbicide “Clearcast”, during the summer of 2017. The result looks promising. Waterfowl presence has increased and recreational use has improved. The City of Framingham’s funding for the 2019 fiscal needs to be renewed to move forward. A three pronged approach to remediate this crisis will be required for long term impact including; harvesting the plants by hand, mechanical machine harvesting and herbicide application. The biomass is massive and makes hand harvesting impractical on a large scale. 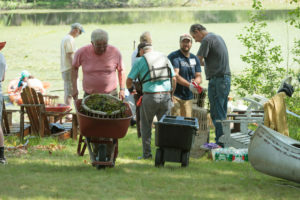 Two community hand harvesting efforts involving 45 volunteers removed over 300,000 plants from the river, however impacting less than 1% of the vegetation. Although hand harvesting is appropriate as a follow up moving forward, it has limited impact on this massive over whelming infestation. 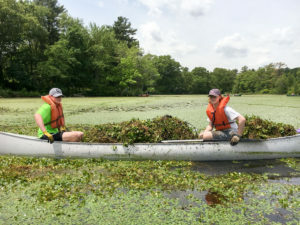 As a follow-up to the “Clearcast” application and the expected water chestnut die back on this year's vegetation a hand harvesting is being planned for late July 2018. Machine harvesting of the invasive plants can be successful on the river where the depth is greater than two feet. 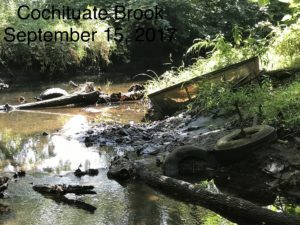 The Sudbury River does not lend itself easily to machine harvesting do to a lack of access for the necessary mechanical equipment. Hopefully an access point will be created soon. There are billions of water chestnuts on the river bottom from past and current years. They germinate irregularly and maintain their viability for up to 15 years. 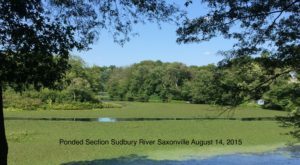 Many years of attention and support of this effort will be required to have the impact that is necessary to restore the Sudbury River in Saxonville to a more natural and healthy state. 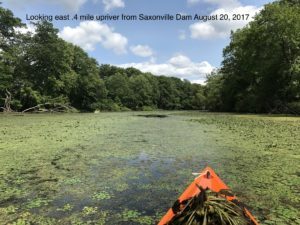 Friends of Saxonville had a river cleanup event along the river between the dam and Pinefield on Saturday, June 24, 2017. They pulled a lot of trash out of there including a golf bag! There is still more to do. There is some poison ivy in there, which kept them away from a few places. 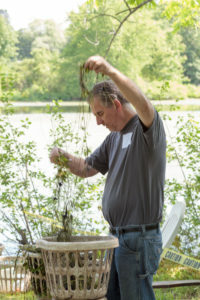 Ron Chick, River Stewards Chair (ronchick@comcast.net) spearheaded this project. Held on September 16, 2017. 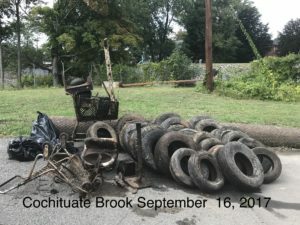 A section of Cochituate Brook in Saxonville was discovered to have a great deal of debris, including over 30 vehicle tires, a kitchen sink and much more. This effort was led by several FOS River Steward Committee members (Jane & Ed Clarke, Jane Joiner and Ron Chick). 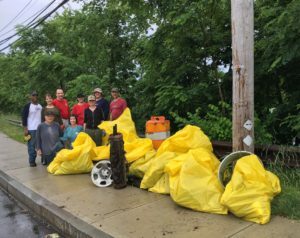 A Boy Scout Troop from Cochituate also cleaned up a second location on the Sudbury River at Little Farms Road. Discuss your concern for the overall health of our watershed with the Mayor and City Council. 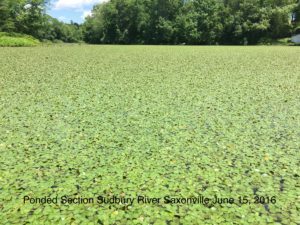 Express particular interest in the Sudbury River in Saxonville and the invasive vegetation. 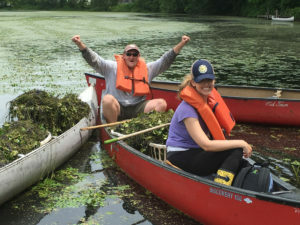 Communicate support for the Framingham Conservation Commission’s five-year plan for combating invasive vegetation on the river and elsewhere in Framingham. 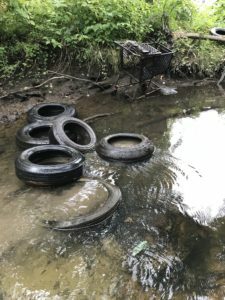 Participate in or initiate watershed debris cleanups. 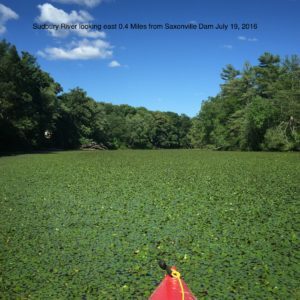 Look for postings of a follow up hand pulling of the invasive Water Chestnut after 2018 treatment, likely late July. 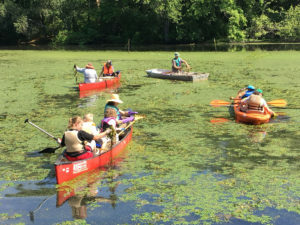 Participate in OARS sponsored watershed clean up in September. Participate in RiverFest on June 16-17, 2018. 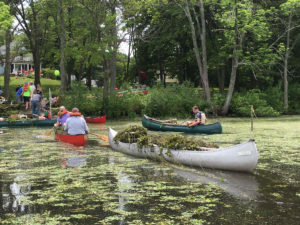 Framingham has several Sudbury River related activities, including a river paddle on June 16 at 8 AM. 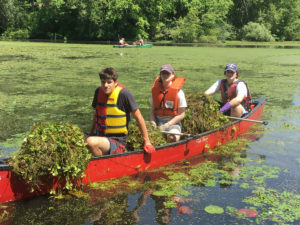 See the invasive water chestnut first hand and experience how this invasive affects the rivers recreational use. 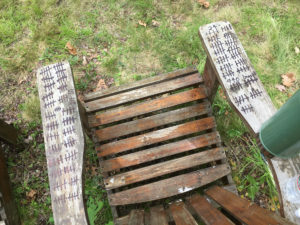 sudbury-assabet-concord.org. 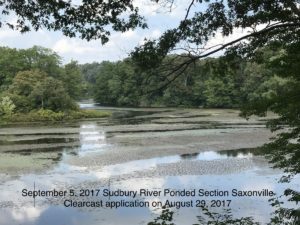 Download State of the Sudbury River from the Saxonville Dam upstream 1 mile to the Wickford St. Bridge (PDF) - a special report commissioned by The Town of Framingham in 2015. The report includes recommendations for restoring this tremendous resource to a more natural state.